The February 2019 examination was held in New York, NY with 8 applicants in Adult or PreGrad part 2 Psychoanalysis of which 7 passed for a 87.5% pass rate, and 1 applicant in Child Psychoanalysis of which 1 passed for a 100% pass rate. We would like to congratulate the following individuals for passing the certification examination and becoming a Fellow of the American Board of Psychoanalysis. 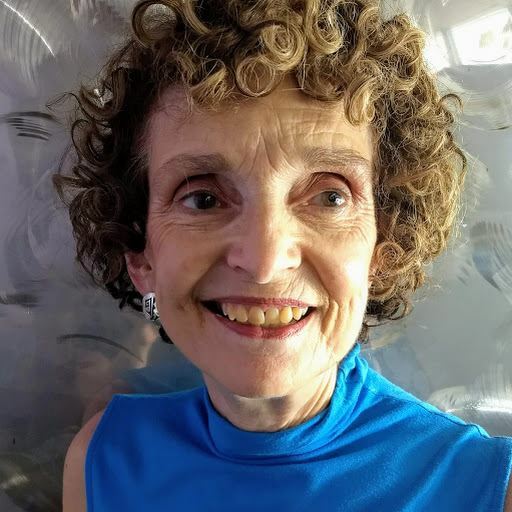 The American Board of Psychoanalysis is pleased to welcome Dr. Leslie Jordan, who will assume the role of Chair of the Research and Development Committee in February 2019. Dr. Jordan is a psychoanalyst and educator at the Denver Institute who has an abiding interest in research. She was a research fellow at the IPA Research Training Program in London taught by analyst-researchers from around the world. She has been involved in the evaluation of learning for many years (see Jordan, L & Emde, R (2006) "How do we Evaluate Learning from the Curriculum?" JAPA 54:231-249). She is currently Chair of the Research Committee at the Denver Institute and co-directs the Colloquium Project for evaluation of learning. The ABPsa wishes to express its deep appreciation to Dr. Sydney Anderson for her valuable contribution as Chair of RDC since 2015. The June 2018 examination was held in Chicago, IL with 7 applicants in Adult Psychoanalysis of which 5 passed for a 71% pass rate. The February 2019 certification examination will take place at the New York Hilton, in New York City. Examination dates are Saturday February 2nd - Monday February 4th. The Handbook for Applicants , Handbook for Pre-Grad Applicants, and more information can be found on our website. The February 2018 examination was held in New York City with 11 applicants in Adult Psychoanalysis of which 5 passed for a 45% pass rate, and 1 applicant for Child & Adolescent Psychoanalysis that passed for a 100% pass rate. The ABPsa Board recently approved a Fellow Emeritus status. This new registration category was created in response to Fellows’ desires to maintain their ABPsa registry listing upon retirement and to support the value of standards. 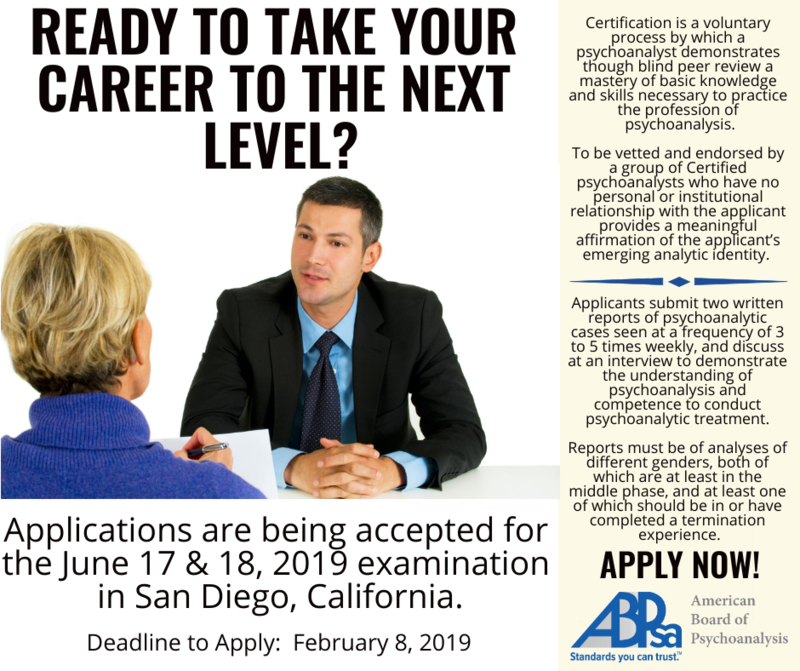 Fellow Emeritus status is available to ABPsa Fellows who, regardless of whether they remain licensed in their mental health discipline, have and remain completely retired from the practice of psychoanalysis, as well as any other psychotherapeutic activity, with patients. Their licenses and other professional affiliations must be in good standing upon retirement and remain so. The American Board of Psychoanalysis does not certify Fellow Emeritus in the active practice of psychoanalysis. Eligible fellows can apply for the Fellow Emeritus status by completing an application and submitting a one-time fee. Further details and the Fellow Emeritus application is available on our website www.abpsa.org. We migrated over to a new website platform that should make navigating our site and renewing your certification even easier! Also note, that our phone number has changed to (303) 676-8008. Analysts certified by the Board on Professional Standards of the American Psychoanalytic Association prior to December 31, 2015. Analysts certified by ABPP or BCD-P prior to December 31, 2015 and who are graduates of APsaA, ACPEinc or IPA Institutes. Analysts certified prior to December 31, 2015 by ABPP or BCD-P who are graduates of psychoanalytic institutes not approved by APSaA, IPA or ACPEinc, but who can document training that is equivalent to AAPE, ACPEinc, or IPA training standards which includes both training analysis and control analyses conducted on an individual basis at a frequency of three to five times a week. Analysts who graduated from psychoanalytic institutes not approved by APsaA, IPA, or ACPEinc but who can document training that is equivalent to AAPE, ACPEinc, or IPA standards which includes both training analysis and control analyses conducted on an individual basis at a frequency of three to five times a week and who have had no prior opportunity for certification in their respective discipline, and have been appointed a training analyst by their institute.